Whether it’s the holidays, or our everyday life, we all need to be more mindful of our place in the world and what we consume. The products we use and what we do with them when we are done with them matter to our environment. With precious natural resources we need to think about each act of consumption with an eye to sustainability and its future impact. Our Wholesome to the Core initiatives don’t just apply to our personal health and well-being, they also apply to the world around us and we take our sustainability initiatives seriously. From chipping and mulching all of the old trees and trimmings to recycling waste oil for heaters and capturing sunshine for solar power we put our environment first. In fact, the solar power at our warehouse generates enough energy to power 15 homes per year. And speaking of waste, holidays are one time of year, when we all can get a little crazy. Research by Stanford University found that Americans throw away 25% more trash between Thanksgiving and New Year’s, generating an extra 25 million tons of garbage in just 6 weeks. Where does that extra trash come from? Wrapping paper and ribbon, holiday décor, Christmas cards and even food waste. 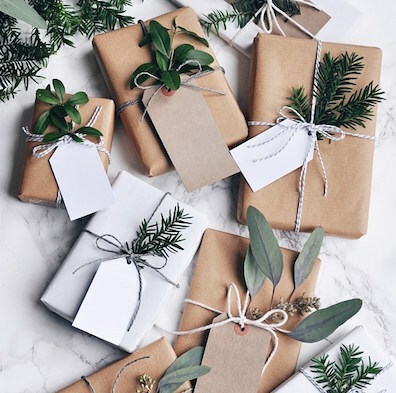 Did you know if every American family wrapped just 3 presents in re-used wrapping or recycled materials it would save enough paper to cover 45,000 football fields. And we send so many Christmas cards that we could fill a football field 10 stories high with just cards, and each person accounts for 100 pounds of food waste during the holiday season. These numbers are staggering and it’s clear that we should spend a little more time this holiday season thinking about how and what we consume…or quite frankly, what we don’t, with our eye toward sustainability. That doesn’t mean you can’t have beautiful festive things, so we have a few ideas to share with you. Waste not, want not, fa, la, la, la, la —is all part of living wholesome to the core! 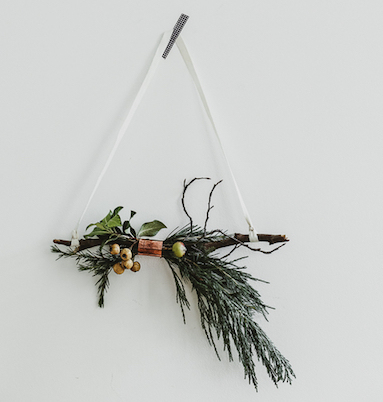 Here’s a little inspiration for some of our favorite ideas for recycled, reusable, and edible décor for your next holiday party! 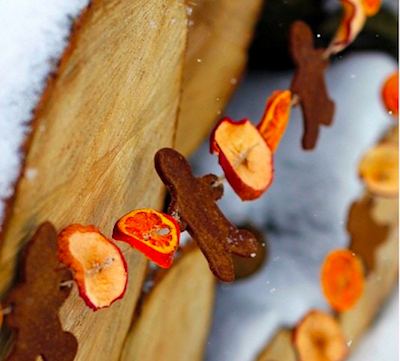 No matter how you cut them, bundle them, paint them, or arrange them, twigs aren’t just trendy, they “stick” around. Better yet, you don’t have to be a DIY expert to make them look good. Ok, we know we’re biased on this one. But there’s a reason that fruit has inspired still life artists for centuries. Not only is it beautiful, it’s the perfect practical decorative element. We love using kraft paper, newspaper, and foliage to create chic, unique looking packages. Even try giftwrapping photos on your walls to add some extra festive punch! Bringing herbs inside for the winter? It’s a great time to trim your herbs and repot them into tiny containers. 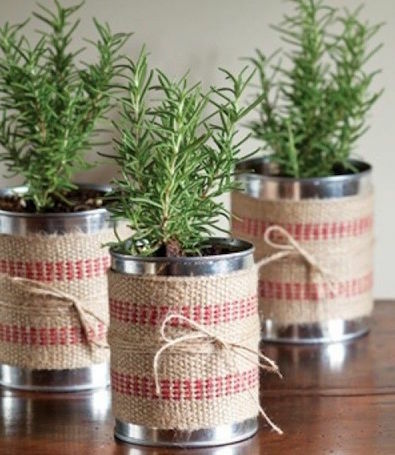 For even more recycled goodness, repot into used tin food cans and decorate. 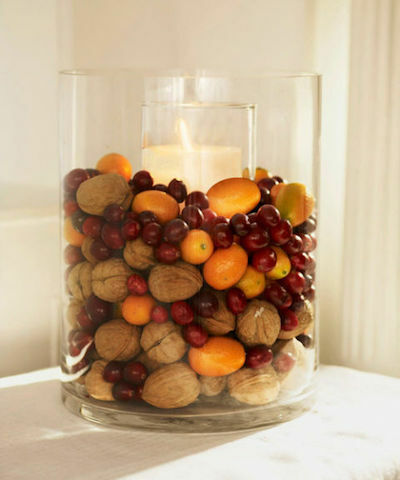 These make a great addition to a holiday table and can even serve as party favors for guests at the end of the night. 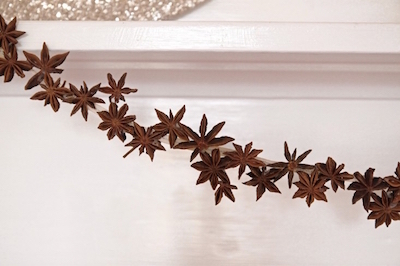 With its spicy aroma and festive shape, star anise is the perfect dynamic holiday spice. 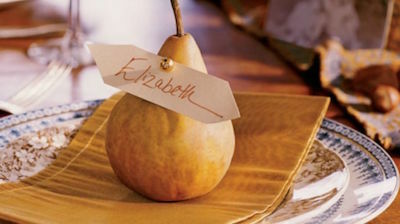 Before you toss it in your cider, try featuring it in a garland or tied to a cute holiday mobile. 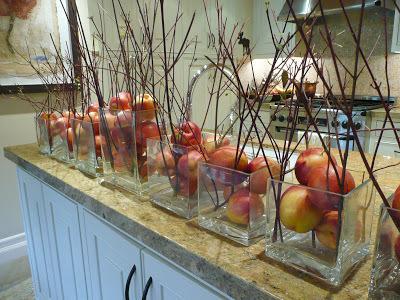 Better yet, mixing some dried fruits like apples and oranges together can create a homey garland perfect for any home. Here are a few additional tips for living a more sustainable and Wholesome to the Core Holiday. Give the gift of time and experiences rather than things that aren’t needed or can be disposed of. If you like to give things, try homemade gifts that can be used. Plan ahead and have decorated containers and recyclable bags for each of your guests and prepare “doggie bags” for each family to take home leftovers to prevent holiday food waste. Buy only recyclable wrapping paper and skip the ribbon. 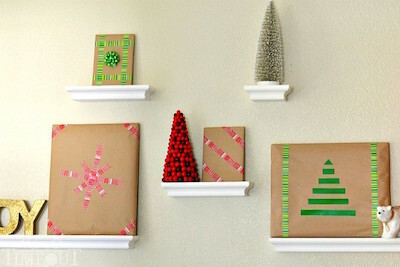 Instead make package decorations with reusable materials. Be sure to compost your holiday tree rather than sending it to the landfill. These are just a start! The possibilities for recycled and useful holiday décor are endless. From all of us at Rainier Fruit, we hope you have a wholesome and happy holiday season and keep living Wholesome to the Core.